Figure. This schematic portrays important processes that couple dynamics, chemistry and cloud microphysics in the UTLS region. The dashed green line represents the time average tropopause. In the tropics, maximum outflow from deep convection occurs near ~12-14 km, while the cold point tropopause occurs near 17 km. The intervening region has characteristics intermediate between the troposphere and stratosphere, and is termed the tropical transition layer (TTL). Extratropical stratosphere-troposphere exchange occurs in tropopause folds and intrusions linked with synoptic weather systems; these events transport stratospheric air high in ozone into the troposphere. Transport above the subtropical jet (STJ) couples the TTL and the extratropical lower stratosphere. 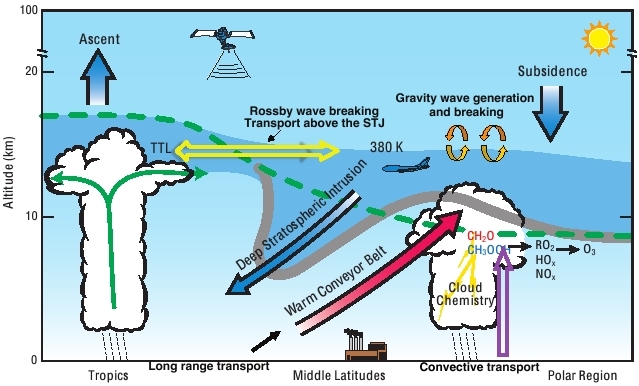 In addition, synoptic scale uplift (‘warm conveyor belts’) and deep convection brings near-surface emissions of gases and particles into the upper troposphere, where they can strongly influence global-scale chemistry. Gravity wave generation and breaking also contribute the mixing of chemical constituents in the UTLS. To subscribe to the UTLS mailing list, visit this page.